* Make a booking directly from your Handset / Device. Once your Taxi is booked you will receive a email/call ortextSMS message confirming your booking. 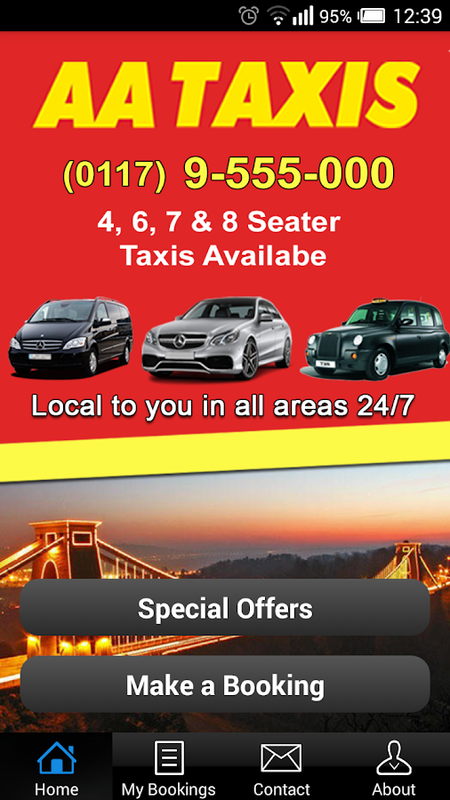 This Taxi Booking App allows you to book aTaxi or Private Hire Vehicle from Blue Star TaxisWith this App you can:* Make a booking directly from your Handset / Device. * Order your Taxi discreetly in a noisy place when it is difficultto make a phone call.FEATURES:-Use GPS to pinpoint your current location as a pickup point.-Use GPS to find your location.-Cash, Account or Card payment option.-Save your details for any future bookings.-Choose how many passengers require a Taxi.Once your Taxi is booked you will receive an email or call toconfirm your booking. 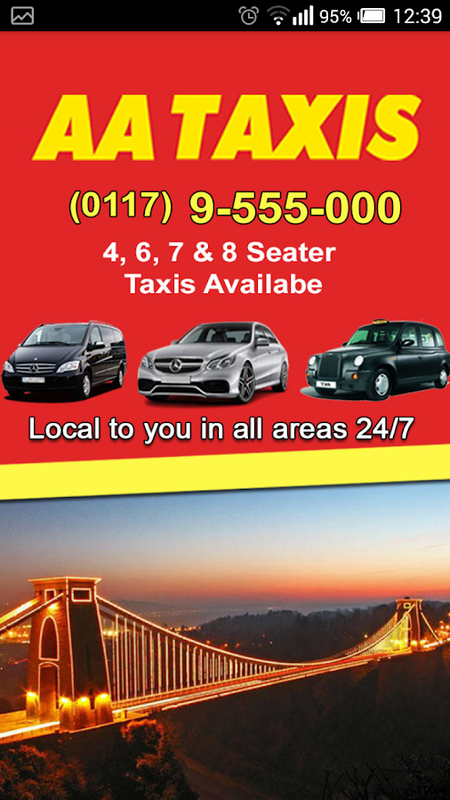 This Taxi Booking App allows you to book aTaxi or Private Hire Vehicle from LetsgoWith this App you can:* Make a booking directly from your Handset / Device. * Order your taxi discreetly in a noisy places in which it isdifficult to have a phone callFEATURES:- Use GPS to pinpoint your current location as a pickup point- Use GPS to find your location- Book Account or Cash- Save your details for future booking- Chose how many passengersOnce your Taxi is booked you will receive a email/call or textSMS message confirming your booking. This Taxi Booking App allows you to book aTaxior Private Hire Vehicle from Perwood CarsWith this App you can:*Make a booking directly from your Handset / Device. *Order your taxi discreetly in a noisy places in which itisdifficult to have a phone callFEATURES:- Use GPS to pinpoint your current location as a pickup point- Use GPS to find your location- Book Account or Cash- Save your details for future booking- Chose how many passengersOnce your Taxi is booked you will receive a email/call ortextSMS message confirming your booking. This Taxi Booking App allows you to book aTaxior Private Hire Vehicle from Alpine TaxisWith this App you can:* Make a booking directly from your Handset / Device. * Order your taxi discreetly in a noisy places in which itisdifficult to have a phone callFEATURES:- Use GPS to pinpoint your current location as a pickup point- Use GPS to find your location- Book Account or Cash- Save your details for future booking- Chose how many passengersOnce your Taxi is booked you will receive a email/call ortextSMS message confirming your booking. 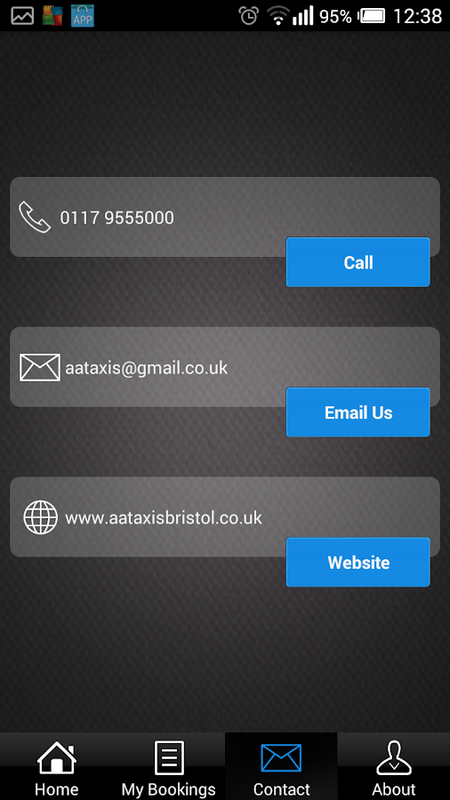 This Taxi Booking App allows you to book aTaxior Private Hire Vehicle from A2B Oxford TaxiWith this App you can:* Make a booking directly from your Handset / Device. * Order your Taxi discreetly in a noisy place when it isdifficultto make a phone call.FEATURES:-Use GPS to pinpoint your current location as a pickup point.-Use GPS to find your location.-Cash, Account or Card payment option.-Save your details for any future bookings.-Choose how many passengers require a Taxi.Once your Taxi is booked you will receive an email or calltoconfirm your booking. 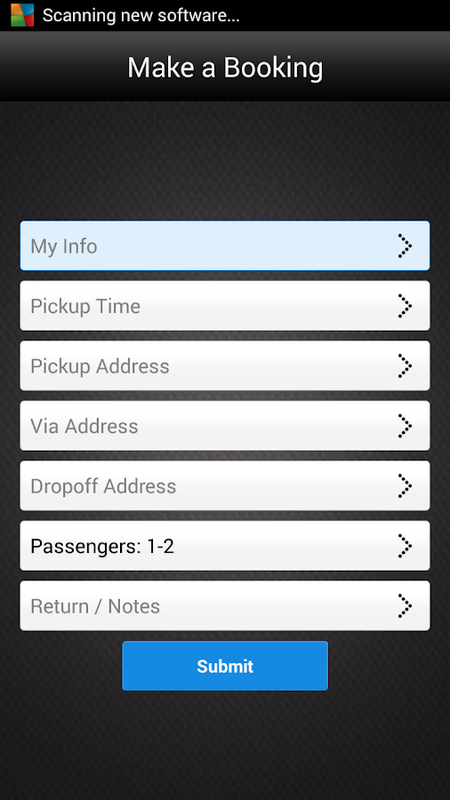 This Taxi Booking App allows you to book a Taxi or Private HireVehicle from Booking LimosWith this App you can: * Make a bookingdirectly from your Handset / Device. * Order your taxi discreetlyin a noisy places in which it is difficult to have a phonecallFEATURES:- Use GPS to pinpoint your current location as apickup point- Use GPS to find your location - Book Account or Cash- Save your details for future booking- Chose how manypassengersOnce your Taxi is booked you will receive a email/call ortext SMS message confirming your booking. This Taxi Booking App allows you to book aTaxi or Private Hire Vehicle from Ibiza TaxisWith this App you can:* Make a booking directly from your Handset / Device. * Order your Taxi discreetly in a noisy place when it is difficultto make a phone call.FEATURES:-Use GPS to pinpoint your current location as a pickup point.-Use GPS to find your location.-Cash, Account or Card payment option.-Save your details for any future bookings.-Choose how many passengers require a Taxi.Once your Taxi is booked you will receive an email or call toconfirm your booking. Corporate Cars - Brisbane Executive CorporateLimo TransfersDescriptionWelcome to the CorporateCars experience!CorporateCars is by far the safest, reliable & easiest wayto get from A to B. It is a simple to use app that you can use torequest a Corporate Car in Brisbane, Queensland Australia.Our professional drivers pay special attention to your personalassistance and maintain a high degree of flexibility, security andtime saving. CorporateCars guarantees comfortable and efficientprocesses from the booking procedure to the ride itself up to theinvoicing.You can book CorporateCars. for your airport transfers at thetakeoff location and your destination airport or on an hourly basisfor a trip to subsequent meetings.CorporateCars service includes to/from Airport Transfers wherewe will track your flight and have your driver at the airport uponyour arrival. Point-to-Point Transfers to/from restaurants, hotels,office meetings, residences and multiple destinations. Also bookHourly/As Directed transportation to enjoy a night out on the townwith family and friends. We are #1 in providing innovativesolutions for your travel needs by providing exceptional service!No detail is too small, no request too big.With just a few taps of the finger CorporateCars offers:- Easy booking/ for single or multiple passengers- Bookings will be applied directly to your account- Use GPS to pinpoint your current location as a pickup point aswell as your regular pick up points and destinations- Cash, Account or Card as your prefered payment option.- Save your details for any future bookings.- Once your Transfer is booked you will receive an email or call toconfirm your booking.- Reusable booking history lets your use regular routes with theclick of a button- Download our FREE app TODAY!About UsBrisbane Corporate Cars can provide a premium transport service foryour next journey. We provide an efficient and reliable serviceincluding comfortable and spacious vehicles chauffeur driven byprofessional and courteous drivers.Since 2006 our customers haverelied on us for their Brisbane Airport Transfers, CBD HotelsTransport and Business Class Transfers. Some of our customers havebeen using Brisbane Corporate Cars for over 5 years. We specialiseas an Airport Transfer Service, however, we offer severalspecialised flexible services…● QLD Resource Mining Sector Fly-In-Fly-Out AirportTransfers● Music Concerts and Sporting Event Transfers.● Brisbane Corporate Events, Meetings & ConferencesTransfers.● Brisbane CBD transfers, Charters & Dinner Transfers.● Airport Transfers to Gold Coast, Sunshine Coast &Toowoomba.● Brisbane Portside Cruise Terminal Transfers.● Gold Coast Hotel Accommodation Transfers.● Gold Coast, Sunshine Coast & Brisbane Day Tours.We take pride in our fleet of cars consisting of the latestexecutive cars, kept in immaculate condition with full leatherinterior. We are always complimented on our cars and our clientslove the extra room in the back seat and boot space.Mostimportantly we turn up with a clean car on time every time. Foryour next booking call us on 1300 399 222 or download our Free Apptoday. AA Taxi's free android app allows you to book a taxi directly intoour system, no need to wait for the operator to answer the phoneand take your booking.Once you have registered on our system, youcan make a booking within seconds.You can:• Make a booking for nowor in the future• Check your taxi’s status• Cancel your booking•Find your location using your mobile phones GPS• Manage previousbookings• Manage your favourite addresses• See how far away yourtaxi is on the map using our live tracking featurePayments acceptedby:• Cash• Account• Credit/Debit CardAccount customers are welcome,for new accounts, please email our accounts department [email protected] if you are interested in setting up anaccount.AA Taxi has been providing taxi services to the travellingpublic of Grimsby and Cleethorpes for over 30 years.Our driversare:• Licenced by North East Lincolnshire Council• BTEC Level 2Award in Transporting Passengers by Taxi and Private Hire• CRBchecked by NELC• Passed a local hackney carriage/Private Hireknowledge testPlease Note:This app is for bookings made in Grimsbyand Cleethorpes Areas only.AA Taxi reserve the right to refuse anybooking made through the app. Misuse of this app will result inyour registration being cancelled.